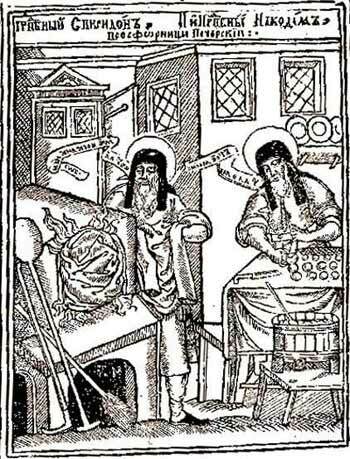 Saints Spyridon and Nicodemus, the Prosphora-bakers of the Kiev Caves, Near Caves fulfilled their obedience of baking prosphora for thirty years. Saint Spyridon came to the monastery during the time of Igumen Pimen (1132-1141), when he was no longer a young man. The ascetic combined his work with unceasing prayer and the singing of Psalms. Even during his life Saint Spyridon was glorified by miracles. He was illiterate, but knew the entire Psalter by heart.